Chimu authorities broadcast their power and status by sporting luxurious attire like feather work, ornate headdresses, and precious jewelry. Only the most elite authority would have worn these gold ear spools. While gold was not valued as currency, its symbolic connection to the sun gave it powerful spiritual currency—especially when fashioned into intricate jewelry. Many ancient Andean societies, including the Chimu, believed their ruler was a living representative of the gods. These ear spools would have been worn in a leader’s impressively distended earlobes. They depict a ruler being carried on a litter by two well-dressed monkey-attendants. He wears a large feather headdress and carries a qero (ceremonial cup) in his left hand and a feather fan in his right. Examples of the type of cup and fan he holds are displayed in this case. 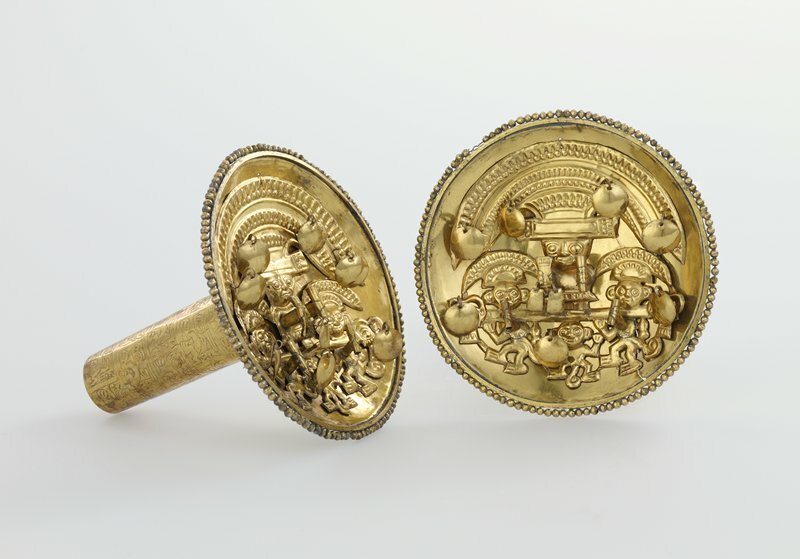 The rich imagery on these ear spools reflects the authority and nobility of the individual for whom they were made.